The most important guitar teacher in Romania. 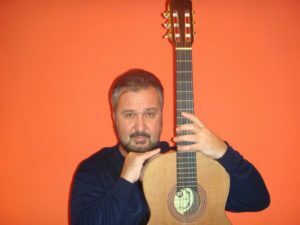 He introduced guitar as a classical instrument taught in the musical institutions of education and created in 1995 the Romanian Guitar Foundation where he is the president. Being considered the best Romanian guitarist and the best guitar teacher in the years of ’80es is the Director of the International Guitar Festivals in Sinaia and Bucharest. He held concerts with orchestra and recitals in the most important concert halls in Romania, recording for Radio and TV. His students are now well known all over the world as some of the important guitarists of the young generation of musicians, wining over 300 national and international prizes. He is invited to teach and participate in numerous international juries in: Germany, France, Italy, Greece, Turkey, Serbia, Slovenia, Czech Rep. etc.